What a great image for spring...and for a pick-me-up sort of card. These images are found in the Spring is Here Creative Cafe Kit's Wishing You Well Add-On Stamp Set. I colored the image with Copic Markers and then distressed the edge of the panel for some dimension. I added some faux stitching around the edge of this card with a white gel pen. The felt flowers are included in the kit as well as the fun green fiber. 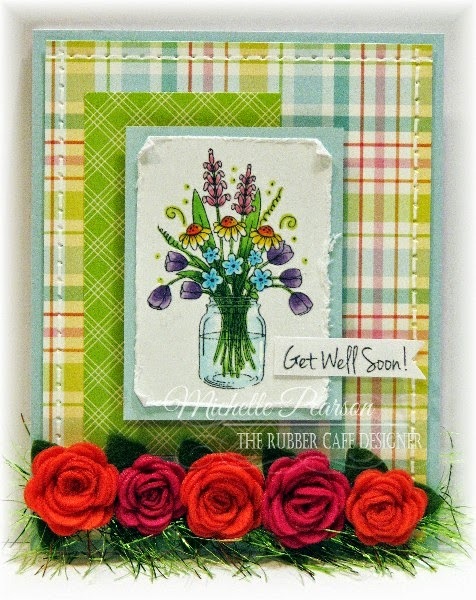 Spring is Here Creative Cafe Kit and Wishing You Well Add-On Stamp Set.